The Tripp Lite PS-402-HG-OEM Medical-Grade Power Strip supplies power to movable plug-connected components mounted to a rack, table or pedestal in operating rooms, patient-care vicinities, therapy rooms, imaging environments and administrative areas. 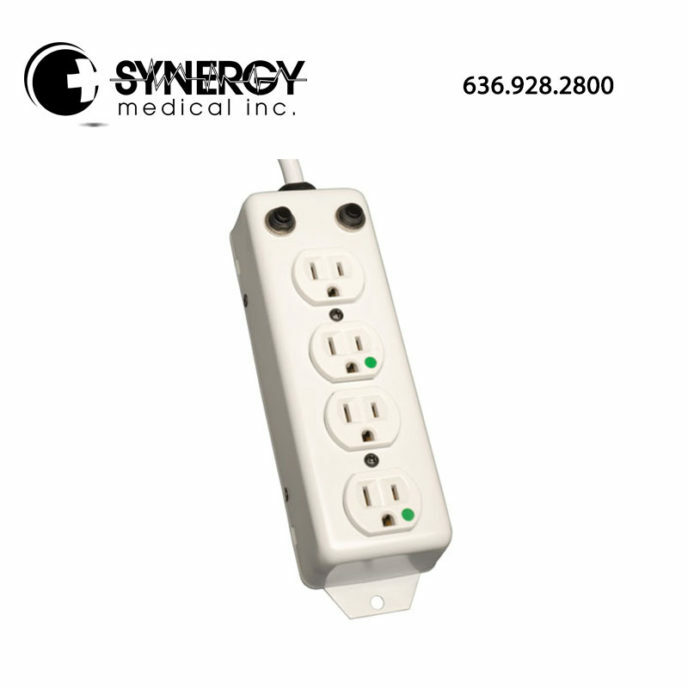 Compliant with UL 1363A specifications, this 120V, 50/60 Hz power strip features a NEMA 5-15P-HG hospital-grade plug and four NEMA 5-15R-HG hospital-grade outlets. Two built-in resettable 15A circuit breakers control power to all outlets and protect the power strip against overloads. Tripp Lite’s switchless design prevents the unit from being accidentally shut off. The 2 ft. power cord eliminates excess cordage that needs to be wrapped. Mounting tabs and flanges let you install the PS-402-HG-OEM on a wide variety of surfaces, such as IV poles, mobile carts, crash carts and mobile medical workstations. The all-metal housing ensures safety and is guaranteed to last a long time in demanding environments.